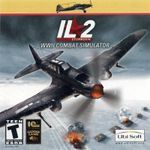 IL-2 Sturmovik is a combat flight simulator that focuses on fun yet realistic game play. It is set on the Eastern Front and provides Early, Mid, and Late War campaigns for both the Russians and the Germans. The player may adjust the settings to as easy or realistic as they like.